This beast is the TVR Sagaris. It has a face of pure evil. It’s headlights are eyes that pierce your soul. It’s illegal in the United States. It’s also in 1:18 scale. The Sagaris is basically a TVR T350 that earned enough XP to evolve ​into it’s final form. The bodywork has so many vents it’s almost perforated, which were to help cool the car for long track days. I can only imagine that The Shredder has one in his garage. In true TVR fashion, it didn’t come with airbags, ABS, traction control, or stability control. It wants to kill you. Sadly, this may be as close as I’ll ever get to a real Sagaris. It will be 2030 before I can import one, anyway. This is the Jadi 1:18 scale model, although they were also branded as Revell’s. I would have loved to be able to see the whole engine bay, but this is what we have. The depressions in the fenders are closed off just like the real car (don’t want any rocks hitting your windshield, do you? ), but they aren’t as dramatic as they are on the 1:1. Around back we find those amazing twin-screw side -exit exhausts, the Perspex clear spoiler, and a single reverse lamp. The rear glass hatch, detailed with defroster veins, also opens. The interior is decently detailed with a few raised buttons and sticker gauges, as expected since this is an older diecast. Of course this particular Sagaris has a story behind it. This was a grail piece of mine and I had been searching for a decent one for about a year. These are apparently very rare in the States, the few that came up on eBay went for well over $100. Before I got discouraged, I broadened my search to include Europe. This one popped up around the beginning of the year. It was listed in the Czech republic without a box, but the seller offered worldwide shipping and was backed by eBay’s guarantee. What did I have to lose? I was the only bidder and won the car for around $85, or whatever that is in Euros. The car was sent economy shipping and I hopped for the best. I expected it to come mid-February as a birthday gift to myself. The estimated 3 week delivery time came and went. A fourth week went by. Then a fifth. I had a Czech post tracking number that led me to nowhere. I bought a BMW M6 instead and filed for the eBay protection guarantee. Then, two days before the deadline was up, a box containing the Sagaris arrived! It had made it! I cancelled my claim and tore open the box. Everything was in good order with the car, so I was as happy as I could be. So there you have it. 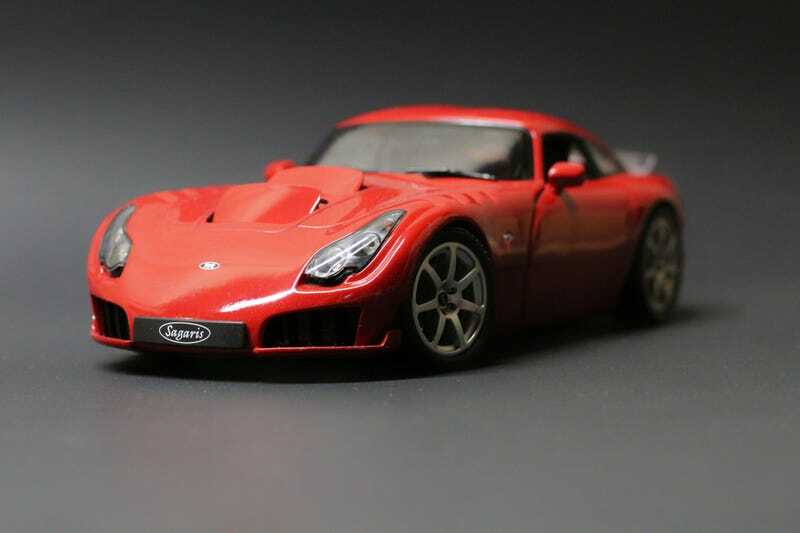 The TVR Sagaris by Jadi. Jadi also had a few other TVR’s in their lineup too. If you are willing to wait, you can get a deal, but most of these command a high price, especially new in box.